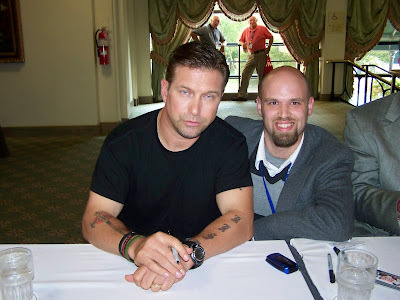 Stephen Baldwin is a successful American film actor, perhaps best known as the youngest of the 4 famous Baldwin brothers. 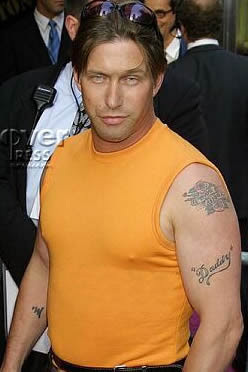 Stephen Baldwin has several tattoo designs scattered around his body including, the letters "H M" (Hannah Montana) after losing a bet with Miley Cyrus. The tattoos on his left arm include, a banner with his wife's name "Kennya" along with several roses, the word "Daddy" with the quotations, plus a Chinese symbol which means "Servant" on his inner forearm. He has 3 tattoos on his back including, the word "Believe" just below his neck, a large prowling tiger on the left side and a design meant to represent sobriety on the right side. Some of his other tattoos include, a Chinese symbol on his inner right forearm which means "Master", four large old english style letters on the top of his left forearm, and a large cross/dagger on the top of his right forearm, plus a design with a name on his right shoulder.